Few weeks back I posted some basics on buying Japanese swords – nihonto. I closed that by citing both dangers and opportunities for prospective collectors who buy on eBay. Well, I have bought a few swords on eBay and made a new purchase earlier this month. Here’s my experience in the hopes it will provide some guideposts for others. The Chinese fake is good quality (for a fake) that I use as an iaito. The main thing this list shows – aside from my tastes getting more expensive over time – is the difference in prices from sellers. The sellers for swords 4 – 6 are dealers in nihonto and Japanese antiques. They are very well monitored on eBay and their auctions tend to get a lot of action. I’m not sure why no one but me bid on sword #4. The quality and condition were good. This just may be an example of a listing getting missed. Swords #2 and #3 are examples you want to emulate if you can. These came from sellers that are mostly inactive in selling swords; fastcashpawnshop is exactly that, it sells anything people bring in on consignment, while sewingtammy1976 sells sword-related stuff but at a very low rate. Sellers like these often don’t know how to list their items and may set reserves that are low. Sword #2, that I posted about here, in particular was a great buy. If you can find listings like these, and you’re satisfied with what you see, go for it. A very old ancestral blade (~500 years old) was remounted and taken to war. The nakago is in great condition with a very nice patina. The mei reads “Bishu Osafune Sukesada.” This sword smith was very prolific and was active in around 1492, according to HAWLEY. The blade has minor nicks but is still very, very sharp.There is one hair kizu typical of blades of this age. 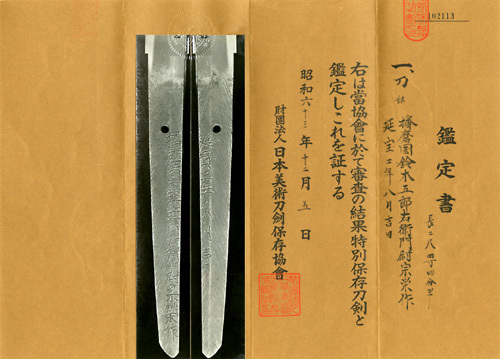 … The blade appears to be ubu (original shape) and shows a graceful Koto suguta (shape) with a deep curvature. Overall, the blade is in *EXCELLENT* condition, as are the mountings. I really liked the curvature of this sword, which is typical for koto blades, and I wanted to own a sword of this period. So I went ahead and won a 22 bid auction. Receiving the sword, however, I found what “very, very sharp” actually meant: This blade has been ground on the very edge. The hamon is still there and the ground area is very thin – a few mms – but this is not how a nihonto should be maintained. I believe someone wanted to see how well this sword could cut, so they “helped” it by updating the edge. Now, I don’t think the damage is fatal. 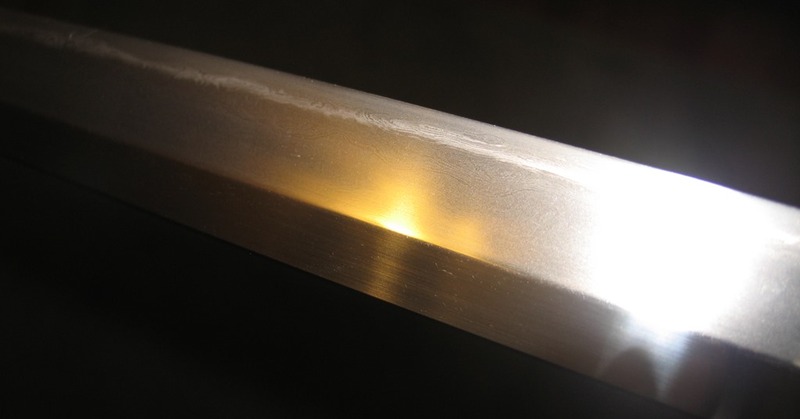 A togishi – a sword-polisher – should be able to restore it. 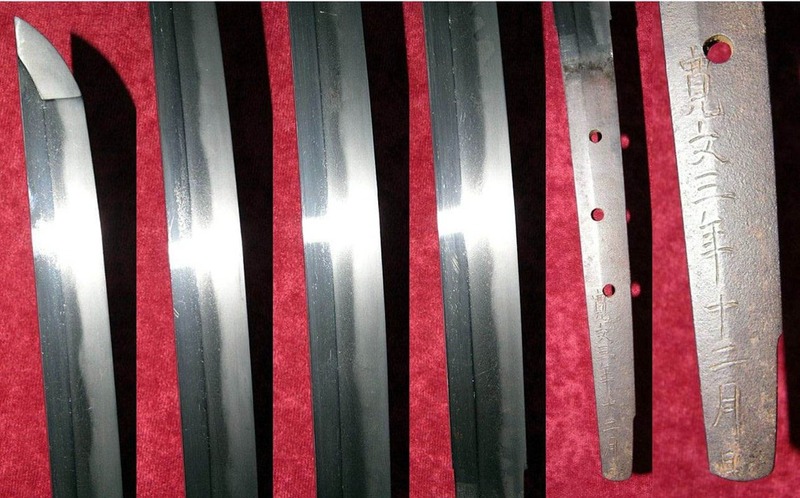 However these older swords can be “tired” – not having much outer metal left – and can only be polished so many times. So, live and learn. I still very much like this sword. The heft and dynamics of it are extremely different from my later period swords, and I’m not doing this to make money. The final bid was entered 4 secs. before the auction ended, by a buyer who had not bid at all up to that point. Almost all the auctions, the majority of the price happens in the final day; it’s easy to be top-bidder early on, like I was with my measly $900. This was a nice koto sword. The auction went from 12 Feb to 17 Feb. I bid early but did not follow-up; I expected the price would go out of my range. And it did: the winning bid was $3,300 which, oddly, was set some 8 hrs before the auction ended, again by someone who had not bid at all before. There were only 3 bidders active in the end-game, and I suppose they lost desire/interest to bid more. When you look at these bidders you will see most bid on nothing but swords, or on Oriental collectibles in general. Like anything on eBay, it is hard to tell if they are real bidders or shills. This was a 20th century sword, forged in 1975 by a smith who had been active in WW II. 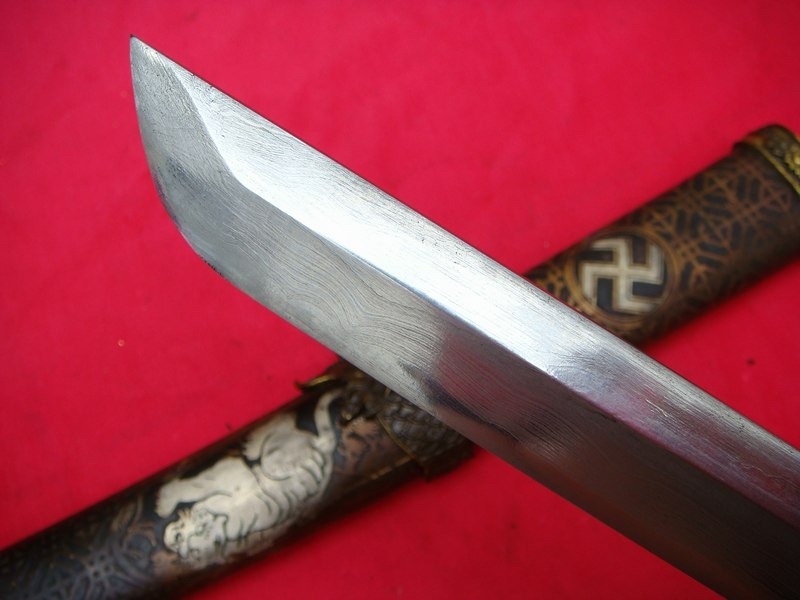 Its length – the cutting edge, or nagasa, was over 30” – made this a more attractive blade. The auction here went 13 Feb to 18 Feb. I got in first for $675 on 14 Feb, and upped to $1,400 on 17 Feb. this was literally a ”brand new” sword, an example of modern day technique where blades are made only incidentally for their cutting function and almost entirely for aesthetic achievement. There were 31 bids on this one, with 10-12 separate bidders. Winning bid was $1,925, made in the closing seconds, again by someone who had not bid before. Would I have gone higher? Looking at the sword and the history, I had set my mental limit of $2,500. Had my Teutonic counterpart exceeded that, right now he or she would be writing this blog. Start by bidding low on a lot of auctions and then follow them to the end, so you get a sense of the prices in the market. Know what you want. Don’t bid on any sword; pick an era, a type, a smith, and try to pursue that. Know your price and stick to it. There are many sword-fish in the proverbial sword-sea; don’t get too attached to winning any particular one. Do lots of searches. Obvious keywords are “katana”, “samurai”, “japan” and “sword”. Use the advanced option that let’s you choose items located in a particular country; eliminate items that come from China. Every once in a while do searches outside “Antiques > Asian Antiques > Japan > Swords”, you may hit that rare listing from a seller who doesn’t normally deal in swords. DO NOT EXPECT MIRACLES. The whole point of these swords is that each one is unique, a tool that someone made long ago for a deadly purpose that nowadays we appreciate for their craftsmanship and for their ability to “open a window”, as it were, to a time, place and a people. Don’t expect to get rich or to find a treasure sword. The best you can hope for is to find a sword you yourself can connect with. If you are interested in nihonto – Japanese swords – you of course wonder where you can actually get blades. The first place is, rather obviously, from a dealer. Many can be found on the web, like Nihontocraft.com or Nihonto Antiques. The advantages of going to a dealer is you will be – or should be – dealing with a person who is knowledgeable and shares your interest in the subject; as I’ll describe below there are numerous pitfalls awaiting the novice buyer and going to a reputable dealer will protect you from being, well, swindled. The downside of going to a dealer tends to be cost. As much as they love and appreciate swords, these people are not charities. They buy and sell unique and high-quality items, mostly for collectors. As you might expect dealers tend to emphasize high-end pieces because they generate the biggest returns. The prestige items for the dealers are swords rated juyo token – “important work” or “important sword”. This rating was established by the Nihon Bijutsu Token Hozon Kyokai (NBTHK) which is the leading Japanese body which ranks and certifies swords. Juyo token typically sell for $75,000 and up. Dealers will have some less expensive items but it’s rare to see a dealer offering a good quality katana-length blade for less than $5,000. 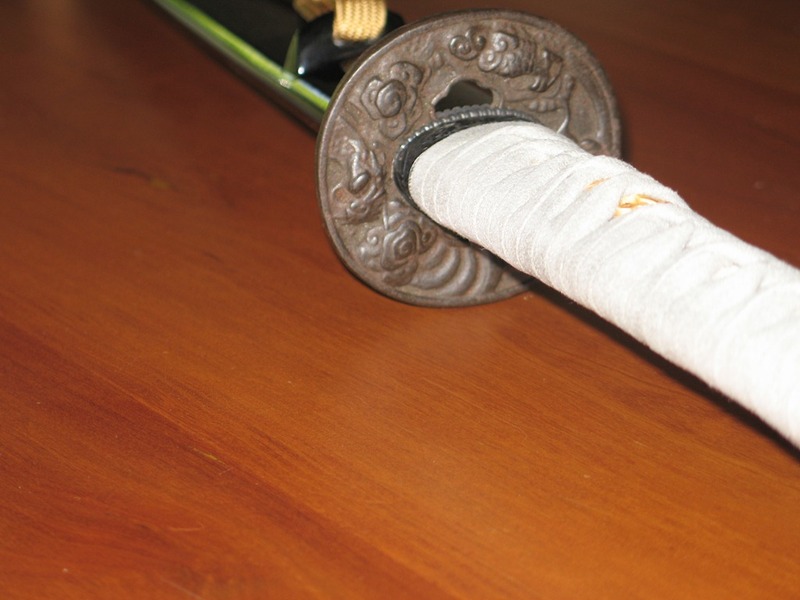 Part of the cost is the “papering” – the NBTHK certification – that is done for most of these swords. Collectors very much want blades with paper. This process takes time – months – and carries costs in $1000s for fees and for travel to the sword-judging venues. And after all that, your sword may not be awarded a paper. So, if you want to start collecting but don’t have $5000-$10,000 to get a blade from a collector, where do you go? Gun shows – euphemistically called “arms collector” shows – often feature swords. These shows happen all over the US – here’s a link to some in the northeast. While these shows are mostly about guns they tend to also have war memorabilia: German daggers and pistols, Japanese flags, and Japanese swords. The swords are invariably described as “bring backs” – i.e. a G.I. got the sword somehow and brought it back to the US. The cliché hope for sword aficionados is that Grandpa Frank found a national treasure sword on the battlefield, didn’t know what it was, and it’s been sitting in his attic ever since; now the grandkids are selling off his stuff and they give the sword – which in their younger days they may or may not have tried out on tree branches and the like – to a gun seller on consignment. I haven’t been to a gun show in decades, but I did buy several blades at shows in Maryland way back when. 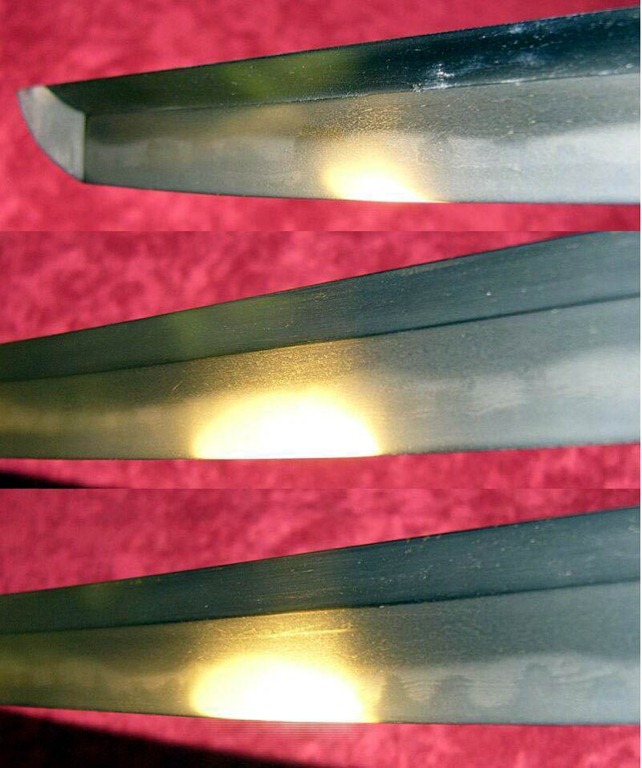 One was an average quality gendaito – 20th century hand-made sword – that I used in Iaido practice for many years. Another was a better quality gendaito that I gave someone as a gift. Finally I purchased a few other “project” blades, of low or unknown quality, that maybe someday I’ll have restored. Back at this time – the 1980s – swords at gun shows were going for $100 – $500. Of course an advantage is you can see and feel the swords, and may even be able to do a little bargaining. The sellers at these shows tend not to be experts, though they may have a kind of rough-and-ready awareness of value for different pieces. Nowadays, my impression is that pickings at these shows are slim. In decades past, the US buying public was not very large nor well educated. There were good quality swords out there and there was little awareness on part of the sellers how valuable they could be. Today there are sword societies in most major US cities and awareness of at least the basics is very widespread. I suggest that the novice visit such shows for nothing else other than building some market awareness, but don’t expect much more that low-quality gunto – machine-made army swords. I’ve left the most treacherous for last: eBay. You might think that Japanese swords are the perfect item to sell on eBay: high value, with a distinctive set of attributes and a rich body of lore, but with a worldwide, very distributed audience. Surely it’s here where one can find access to the greatest variety, and to the best deals? 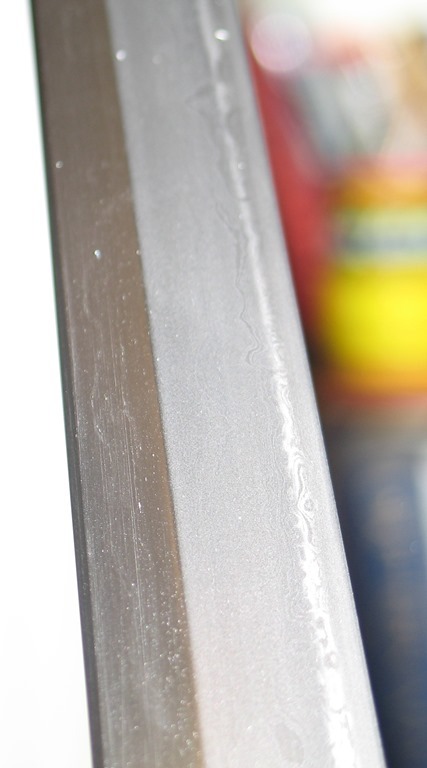 If you look closely you can detect some grain in this blade, but it is far finer than the crude grain in the fake. 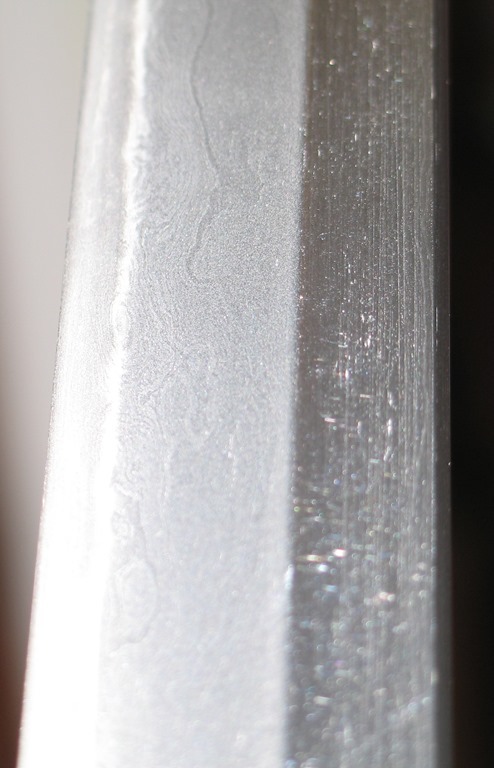 More importantly, the blade shows the hamon, or temper line, the cloudy area of hard steel on the edge of the blade that is the distinctive feature of the nihonto. The hamon is also something that can be faked – for example by acid etching or by selective wire-brushing – but something very hard to simulate is the “activity” in the hamon, the areas of different density or texture. This example is also from eBay. My impression is dealers are using eBay more and more to offer stock of less interest to pure collectors, but that are still authentic nihonto and worthy of study and appreciation. Maybe if one could meet up with these vendors, you would have the best of both worlds. But if not, I think there is still reasonable opportunity to get good blades at reasonable prices. Of this I have some direct experience. Next post: My blades lost, and won, on eBay.